It’s hard to believe we’re back at work already. After the seemingly unending countdown to the holidays, combined with the plethora of parties, hangovers, and Netflix, it’s difficult to get used to being back at our desks, faced with the mountain of work we decided to “focus on in the new year”. So what better way to get back into the swing of work life than to not do that, and start planning your next holiday, instead! 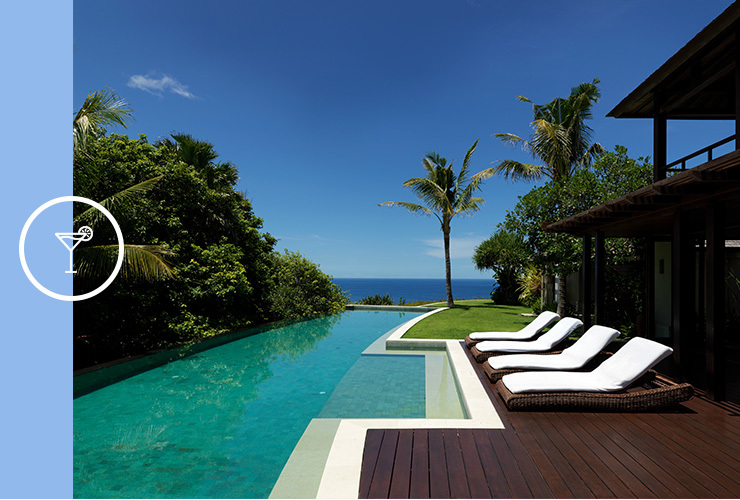 It’s no secret that we are big fans of Bali, here at The Urban List. In case you’re new to the family, it seems we’re a little bit addicted (exhibit A, B, C, D). So, in an effort to have something more than Friday lunch in the calendar to look forward to, we’ve rounded up the latest Bali gems on our wishlist, just for you. The beauty of Bali is that there is always something new to explore. And while we have long established some forever favourites, we were excited to discover some treasures slightly off the beaten track that are well worth your time. If you’re after a little luxury, in some of the most beautiful locations going ‘round, look no further. When you pull up to the grand steps leading up to the Anantara lobby in Uluwatu, there is no doubt you are in for a treat. From the impeccable service, to the slick, spacious rooms it’s very clear from the outset that you’re at a luxury resort. Extra points must also be awarded for the excellent pool/lounge set-up overlooking the ocean—it’s seriously special. And hey, anywhere you can order (and drink!) a BinTang without getting out of the pool is ok by us. The piece de resistance of Anantara, though, has to be their amazing day spa. The setting is lush and tropical (and very quiet, just the way we like it) and the therapists are delightful and oh-so-skilled (extra points for pretending not to notice snoring during treatments). There are so many treatments to choose from as well, so whether you’re after a traditional Balinese massage, or something a bit more exotic, they’ve got you covered. Rolling up to the Four Seasons is a serious pinch-me moment. As soon as you hit the lobby you know you’re in for a treat and the breathtaking views across gorgeous Jimbaran (if you’ve not been to this underrated Bali spot, you must) are next level. Then you see the rooms. Shiiit, they’re slick. Private pools and decks, modern but traditional Balinese interiors, plus all the accoutrements, mean you are seriously in paradise. 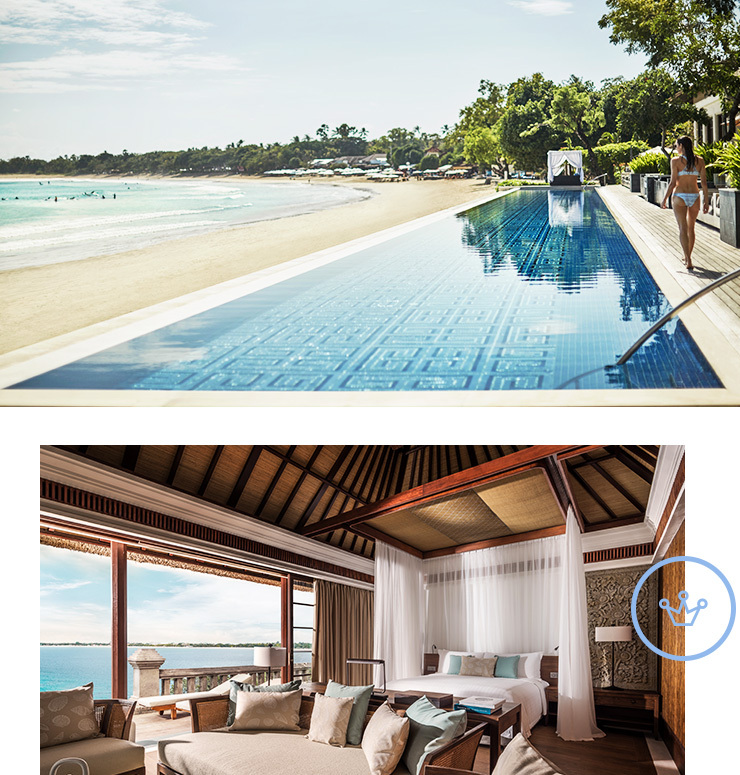 The Four Seasons service is in a league of its own and we love anywhere that takes you from your room to the restaurant (read: bar) via buggy (Sundara beach club is our pick for drinks and delicious eats). And don’t even get us started on the breakfast situation… just think of every breakfast food you’ve ever wanted to eat, with no judgement about how many times you return to the pastry section (important), and you’re there. You know when you see those ocean shots on postcards and you think they can’t be real? Well, walking into the Ungasan resort is kinda like the real-life version of that. The resort is in the Bukit Peninsula, a little off the beaten track, overlooking the Indian Ocean at Bali’s most southern point, but it’s totally worth the trek once you get a glimpse of their absolutely incredible view. Private villas are the order of the day here, and they definitely live up to the hype. Perfect for a big group, each villa consists of a number of rooms within it, plus pools and other facilities to make it a one-stop-shop. You can even get your own private butler to do some of the heavy holiday lifting for you (beers can be hard to open, you know). The other big drawcard of Ungasan is Sundays Beach Club—their private beach club, restaurant and bar, nestled right down on the beach. With great music, food, and cocktails, plus access to beach bean bags (and bean bag service!) and lounge chairs, you’re pretty much set. Plus, the ride down the (very) steep cliff in an inclinator is worth it for the drama factor, alone. Beware though. Sundays is a time machine—you come for lunch and leave as the sun’s setting… Every. Single. Day. Sure, it’s nice to try out some of Bali’s more hidden gems, but any trip to Bali is not complete without a visit to Seminyak. If shopping, eating, and drinking is what you’re here for, this is your nirvana. In choosing a place to stay in Seminyak, you really want somewhere right in the thick of it, because walking (as opposed to jumping on the back of a scooter and winding your way (slowly) through a sea of about 1 million other scooters and cars, all incessantly beeping their horns at you) is your best bet if you want to get around quickly. And this is where eQuilibria comes in. 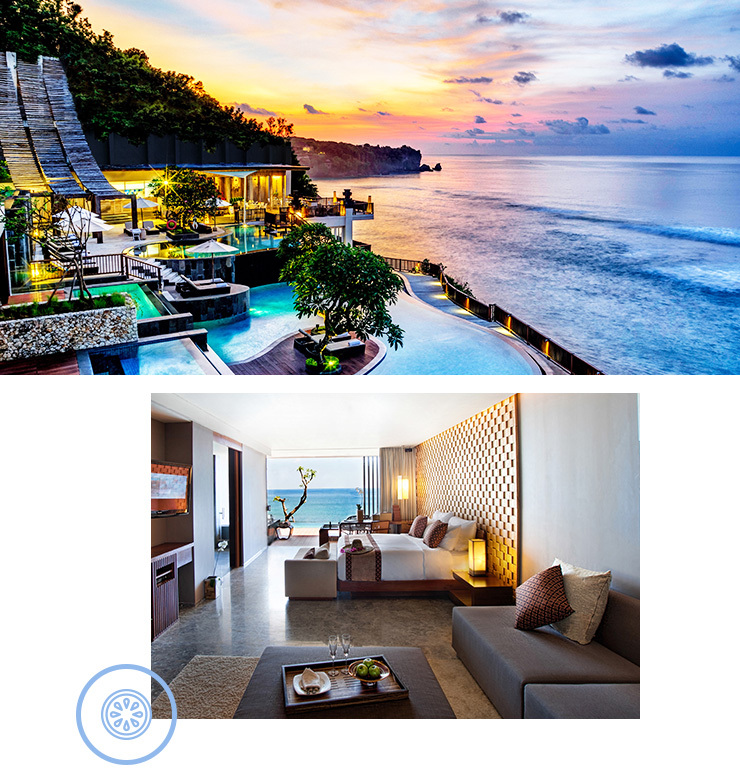 Not only is this resort perfectly located, smack-bang in the middle of town, but its slick, modern design is a refreshing change from the traditional Bali accommodation. The rooms have a unique layout, with floor plans split across two levels—perfect for when your travel buddy thinks sleeping is a ‘waste of time’ and you… don’t. There’s also an excellent pool right in the middle of the resort, with a bar very close by so that you can stay equal parts hydrated and… hydrated. Special mention must also go to the eQuilibria day spa, which hosts some of the best massages in Bali, hands down. Seriously, you won’t regret booking in for one of those bad boys. Ok, so this isn’t technically accommodation, but in terms of essential Bali experiences, it would be remiss of us to exclude Mejekawi, the unbelievable Seminyak restaurant serving up modern fine dining and an excellent drinks list (there’s wine people, WINE! In Bali!) that will knock your socks off. Hidden upstairs at Seminyak institution, Ku De Ta, Mejekawi offers 5-course and 12-course tasting menus, with a focus on showcasing the best local produce that Bali has to offer. It’s hard to overstate how delicious the food at Mejekawi is—it’s insanely good. 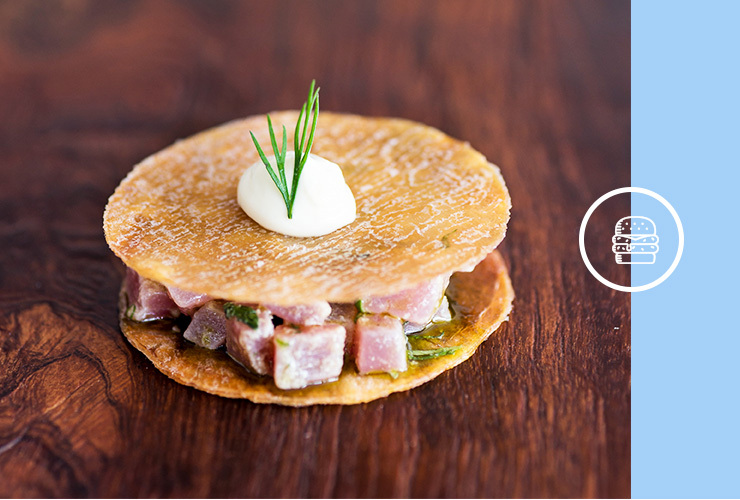 Every course is imaginative and cooked to perfection and matched with the perfect liquid accompaniment. Chef, Ben Cross is kicking serious goals and we’re excited to see what he does next! Need more Bali tips? Look no further. Got tips for us? Hit us up!